As someone who has experienced the sudden loss of a loved one and the associated emotional and financial burden, the story of Easton’s Cause really resonates for me. I honestly have no idea how I would have survived the year I lost my parents without the support of friends and family. That’s why I was so grateful that cofounder Lindsey Thommesen took time away from her preparations for the annual Easton’s Cause festival to speak with me in depth about the work Easton’s Cause does for its community. Easton’s Cause was founded by brother and sister Mike Bauler and Lindsey Thommesen in 2011 after the unexpected death of their seven-month-old nephew, Easton. Easton was a happy, thriving baby with a ready smile and an infectious laugh. He was loved by family and friends—by anyone who met him, really—and his loss was devastating. More than just the emotional pain from losing his son, Easton’s father was burdened with heavy expenses related to lost wages, legal fees, and Easton’s final arrangements. Lindsey looked for resources to help her brother, Andrew, cover his financial obligations during this time, but found that there aren’t public resources available to grieving parents. Thankfully, their community rallied in their support, holding several fundraisers to help Easton’s struggling father during his family’s time of need. The largest fundraiser the community organized was a softball tournament, called the EAB Memorial Softball Tournament. Lindsey and Mike were so blown away by the amazing support their brother, Andrew, received from the community that they founded Easton’s Cause to return the gift and provide support to other families facing major illness or loss. Because the EAB Memorial Softball Tournament was such a success, Lindsey and Mike chose to continue holding the event each year and use the proceeds to help a local family dealing with loss or major illness. Over the past five years the tournament has grown into a full festival, including the softball tournament between 20 area teams, a kids’ carnival featuring superheroes and attractions, a bone marrow registry drive, a toy drive to benefit the Children’s Hospital of Wisconsin, live music, and local vendors. The Annual EAB Festival has a major impact on the community. Not only do all the proceeds from the festival go to benefit the yearly Easton’s Cause beneficiary, but the bone marrow registry drive and toy drive directly benefit other people in need. Last year, the national bone marrow registry gained 70 new donors thanks to the EAB drive, two of whom were already called as potential donors! The 6th Annual EAB Festival was held July 23-24, 2016 at Ralph Park in Fort Atkinson, Wisconsin. The event was wet, thanks to rain, but still wildly successful. The rain couldn’t dampen the spirit of giving and fun for Easton’s Cause supporters. This year Easton’s Cause will be adding to their event schedule, holding their first annual Easton’s Cause 5K race in Spring 2017. Proceeds from the 5K will go into the Easton’s Cause general fund to help area families in need as emergencies arise. 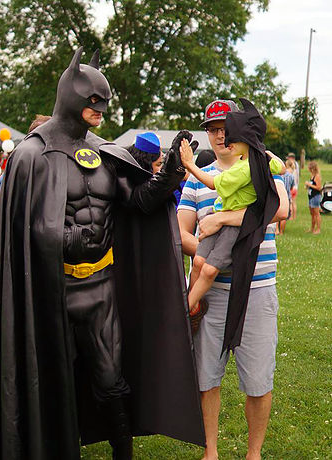 Every year, Easton’s Cause chooses a superhero beneficiary to receive support from the organization. By using the social power of Facebook, they invite members of their community to nominate families in need of help. Nominations can be submitted via a Google Form, and after reviewing all the nominations and the stories of the nominated families, a beneficiary is chosen. Interestingly, the same beneficiary was chosen in 2015 and 2016. That beneficiary is a superhero boy named Alex, who is battling his arch nemesis, Leukemia. Alex was diagnosed with a rare form of leukemia in 2012 and recently underwent a stem-cell transplant. Although the transplant has been considered a success, Alex continues to receive treatments and has a long road ahead of him. The support that Alex and his family receive is monetary, and comes in many forms. Specifically, they receive the proceeds from the EAB Festival, which help cover their travel costs, because their home is an hour away from the clinic where Alex gets his treatments. Alex and his family receive other forms of financial support as need arises. Easton’s Cause strives to support their beneficiary families in every way they can, down to the smallest details that most wouldn’t even think of. They have even provide their beneficiaries with jars of quarters for the vending machines at the hospital. As a 501(c)(3) nonprofit organization devoted to providing financial support to families in need, Easton’s Cause welcomes support from their community to help further their mission. You can be involved in several ways. 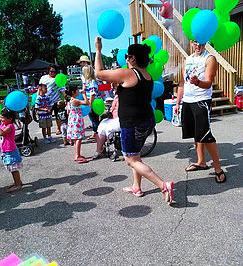 One way to support Easton’s Cause is to volunteer at their events, especially if you’re in the Milwaukee area. The Easton’s Cause 5K will need volunteers to man the registration booth and water station, and support the success of the event. There are many opportunities to volunteer at the EAB Festival, including setup and teardown, concessions duty, manning carnival games, and even umpiring and keeping score for the softball tournament. You can also support the cause by donating goods or services to be raffled or used in running Easton’s Cause events. 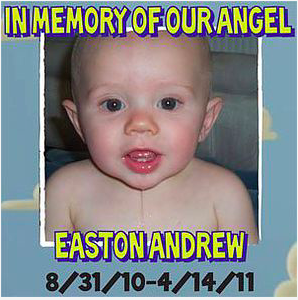 And, of course, you can donate funds to the events or directly to Easton’s Cause. 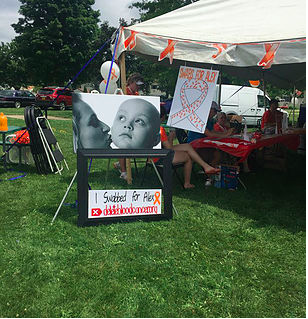 Funds donated to the EAB Festival are included in the proceeds that benefit Alex and other yearly beneficiaries, while funds donated to the Easton’s Cause 5K or donated directly to Easton’s Cause are included in the organization’s general fund to help area families that have sudden needs. To learn more about Easton’s Cause and how you can be involved in this community organization, visit www.eastonscause.org today.